In spite of years of being a seeker driven by a deep longing to experience the Truth of who I am and who we all are as limitless beings, I have been living with a sense of little progress, only limited insights & no real breakthroughs. I arrived hungry for inspiration, for a new approach and for a teacher I could trust. I have not come away disappointed. It was my first Immersion with Igor and it helped me a lot to have had an online session with Sundari Ma a week beforehand. We addressed some anxieties I had about the meditation sessions, which would be different from any I had experienced before. I also asked a number of other questions about the format of the retreat and so on. She was very reassuring in her responses, sharing her commitment to Igor as her teacher, and I was impressed with her openness in relating some of her personal story. There was a professional and yet intimate quality in her that was echoed in the facilitation of the Immersion itself by the whole dedicated team who organized everything under Igor’s discriminating direction. On arrival at the Umbrian venue, which sits in secluded hills surrounded by unspoiled nature, I immediately felt welcome & at home as other students gradually arrived and we started to get to know each other a little. The balance of informal time with meals & social interaction in between the formal programme was just right for me. Plenty of ways to be alone or have quiet, including a ‘silent’ table in the dining room as well as options to eat and rest outside in the garden or by the lovely swimming pool. Initially I was surprised that pastimes of this nature were considered appropriate for a serious meditation retreat, but there was so much respect for the focus on the programme and our more profound reasons for being there, so it was actually very well balanced. It was also a delight to have Igor & Amrita’s children among us for the whole week, bringing their beautiful energy into the ‘field’ and particularly into the pool! I enjoyed the beautifully presented fresh meals and found myself slowing down in this sacred rhythm, enjoying a rest for an hour most afternoons, although I actually became more mentally alert as the week unfolded. In the first session I was surprised that I experienced some sounds & movements so quickly. 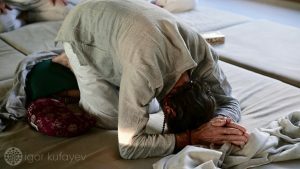 I found myself questioning whether I was making them up or being overly influenced by other people’s Kriyas. I realized it was hard to tell the difference between genuine involuntary responses and my ego wanting me to be part of the hubbub rather than sitting there inert & silent. That evening several of us asked questions along these lines. I reported that the ‘therapist’ in me had been making his presence felt in my meditation, looking for interpretations; whether such and such a gesture, movement or sound might have a meaning or message for me. Igor gave clear, detailed and in depth answers and this was the way he responded to all our questions in Darshan throughout the week. Each day I became more at ease, feeling the Kriyas were mostly involuntary & learning to pick up on subtler reflexes, allowing them, even encouraging them, to build or develop in a way that is hard to explain. Inhibitions I had on the first day lessened in the presence and active field of the most bizarre range of noises I have ever heard together in one room; loud outbursts full of raw emotion alongside the most delicate childlike music; deep notes as if coming from the earth under our feet alongside chaotic babbling nonsense; anguished sobbing or joyful laughter, sometimes both at once, possibly from the same person! And the combined energy of us 30-plus students, a mixture of newcomers like me and more experienced practitioners, was constantly in flux; rising to a pinnacle of sound, then dying away to virtual silence for a few moments before another wave would start, with a different energy altogether. I began to love being in the midst of it all in these sessions. I felt carried on each wave, some harmonious, more often dissonant, although there was a clear development towards synergy and harmony as we got towards the last days. I often found myself dropping into silence & alternating between partially melting into the beautiful chaos of it all then flipping into distracting thoughts that would appear to be bringing me out of whatever ‘magic’ might be happening; and yet slowly I realized that it was just when I was in a distracting thought that a new Kriya would start in a demonstrably unintentional way, at which point I would ‘feed’ whatever was happening with a detached curiosity that seemed to have an enabling effect. It became a delight to feel and know that something other than me, but deeply individually within me, was orchestrating this process. It felt so freeing and potentially healing or cleansing, and it continues this way as I develop trust, based on Igor’s incredible explanations and guidance, that Kriyas are the essential key to unblock sanskaras, clearing the way for the doorways to perception to open. It was as if things that had been trapped inside all my life were finding their way to be released. The sudden unleashing of trapped energies was almost blissful at times such that I was on the brink of laughter & tears at the same time. I noticed there was an emphasis on breath, breathing (pranayama) & deep chanting that seemed to be literally opening up my throat, perhaps working on the chakra there. It felt significant & very relevant. Of course I have only been reporting on sounds so far because these meditations are experienced with eyes shut and we could not tell what movements & gestures others were engaged in. My movements: Some repeated themselves each day, but everyday there were new ones too as well as new sounds. It was a real adventure, waiting at the beginning of each session to see what might happen next; a tragi-comedy play where one feels like the spectator and the central character at the same time! But I don’t want to trivialize what feels like such a powerful process. In Darshan Igor skillfully laid out the foundations that underpin the theme of the Immersion. Each day we learned more about the traditions, texts & teachers that have informed his approach, and it was clear that he had put years of dedicated research into finding verification for the deep insights that had come to him personally through direct experience. The breadth of his knowledge is very impressive. Each Darshan was a mind-expanding experience for me. He admits that he is not teaching from any one lineage and does not have the official approval of his teacher, Maharishi, to be a teacher. But the luminosity of his explanations of the nature of consciousness are all the more rich and exciting. I appreciated how he shared many examples from his own life as well as that of well known Indian sages. Each day I became more in awe of Igor’s seemingly photographic memory for names, facts, & Sanskrit terms with definitions, revealing to us the subtle concepts of spiritual anatomy and the light body, Kundalini and unity consciousness, all held in the magical arms of Shiva & Shakti. Each day aspects of this that had previously been confusing or wooly for me came into a greater clarity & many gaps were filled so that I have come away with a clear sense of the path and a commitment to it. Many years ago I learned about Tantra from the perspective of Tibetan Buddhism and for the last two years I was following Sri Mooji’s Advaita teachings, but I have come away from this Immersion with a totally refreshed view of both, plus a very convincing rationale from Igor that the Tantric path is essential. We learn to use and experience every aspect of human life and through the eyes of an artist, denying nothing, we learn to see, touch and smell the beauty in everything, literally everything. Art & Design was my original training, I have been a craftsman in wood all my adult life and this was music to my ears, nectar to my soul as we entered the world of Aesthetic Rapture. I have been on a path of personal healing as well as a spiritual seeker for many years. I was becoming resigned to living with certain psychological scars and the behavioral limitations that result from those scars. I had been feeling the need for more specific and personal spiritual guidance. Igor’s work is offering me a new and challenging direction for my Sadhana, with the possibility of my personal ‘hang ups’ melting away as a bi- product of the evolution of consciousness. I feel humbled, exalted refreshed with the rise in my Pranic body already making it’s presence felt after just one week. 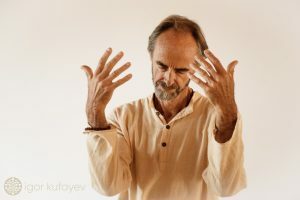 Igor tells us we are not committing to this amazing Kriya practice just for our own evolution of consciousness but for the healing & evolution of the collective. We are living in such exciting times now in which the threat of collapse is reaching global proportions while the rising shoots of evolutionary renewal are growing stronger everywhere. Igor’s injunctions to be part of that essential movement from which radically new stories will need to unfold to guide mankind into a new era, is convincing and authentic. I have left the Immersion and all the beautiful people I met there, injected with a deeply refreshed conviction to be one of those rising shoots. During the week I voiced the deep chants of a Tibetan monk, experienced spontaneous pranayama breathing, found my body shaking violently, limbs flailing as if being attacked by invisible demons. I went from expressing an outburst of anger to tender tears of grief in a few seconds, spoken in tongues and floated blissfully on the waves of chaotic sounds all around me, all in the safety and knowledge that there is an inherent mysterious wisdom orchestrating the clearing of our light body and slowly building our pranic energy. We are told that there is no need or benefit in knowing what it all means. I can feel myself surrendering to the process as I imagine ‘melting into the Goddess’. I feel deeply blessed to have found Igor through his interviews and recordings on You Tube. I feel even more blessed to have been able to attend this powerful Immersion. Time will tell and the proof is in the pudding, as Igor tells us. Igor’s work is unique I believe. He says himself that it is not for the faint-hearted, yet it needs to grow. It upsets me to realise that it has been slow to spread so far. I can envision greater recognition of his work and a rapid expansion of his influence, which would be a great blessing to the world and the future of humanity. There is nothing more important than spiritual evolution and I believe this work is at the cutting edge. 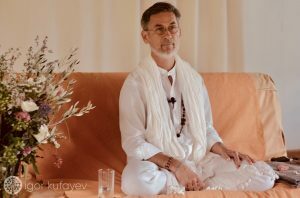 – Ardhan Swatridge, first-time participant of the week-long immersion “Aesthetic Rapture – Tantra‘s Hidden Path & the Power of Beauty” with Igor Kufayev in Umbria, Italy, September 2018. Images: Courtesy of Flowing Wakefulness Fellowship. Read about other first encounters with Igor and this work here. Wow, what a powerful sharing, thank you Ardhan!